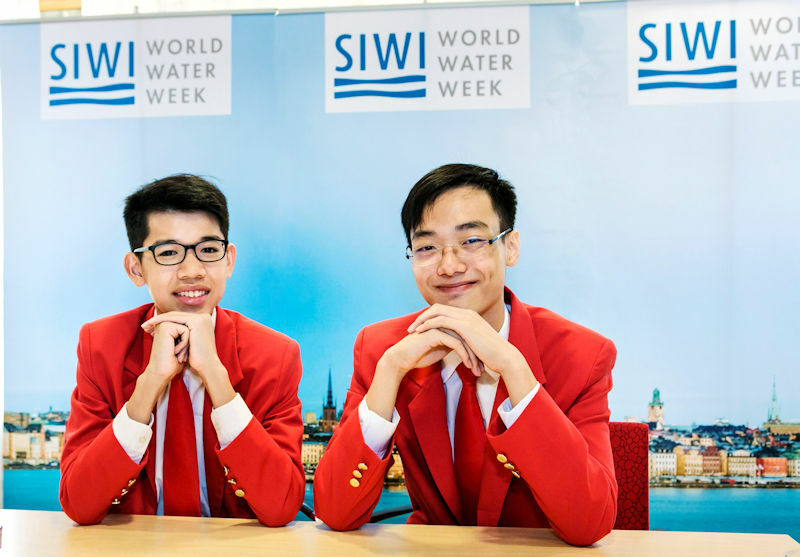 From left, Caleb Liow Jia Le and Johnny Xiao Hong Yu, won the 2018 Stockholm Junior Water Prize (SJWP) for developing a system that uses natural materials to generate reduced graphene oxide that filters water. Photo courtesy of Mikael Ullén, Stockholm International Water Institute (SIWI). A team from Singapore won the 2018 Stockholm Junior Water Prize (SJWP). In August, Caleb Liow Jia Le and Johnny Xiao Hong Yu received the top prize, a sculpture and $15,000, from Her Royal Highness Crown Princess Victoria of Sweden. Their school, Ngee Ann Polytechnic, also will receive a $5000 grant, according to a Stockholm International Water Institute (SIWI) news release. The two students won for their work using durian rind and a sugarcane bagasse, a fibrous by-product of sugarcane stalks, to produce reduced graphene oxide and purified water. The project, “A Novel, Eco-friendly Synthesis of Reduced Graphene Oxide (rGO) from Durian Rind and Sugarcane Bagasse for Water Filters,” presents a low-cost, environmentally friendly alternative to other methods of producing rGO, the news release says. From left, the winning team from Singapore, Caleb Liow Jia Le and Johnny Xiao Hong Yu, receives the SJWP prize from Her Royal Highness Crown Princess Victoria of Sweden. Photo courtesy of Jonas Borg, SIWI. “This year’s winning project inspires communities to find local solutions to improve water quality and resource recovery,” according to the SJWP jury in its citation about the project. “The project developed a leading-edge, inexpensive, and widely applicable method to clean water.” By incorporating such concepts as the circular economy, nanotechnology, and green chemistry, the project embodied the 2018 World Water Week theme of “Water, Ecosystems, and Human Development”, the jury citation said. 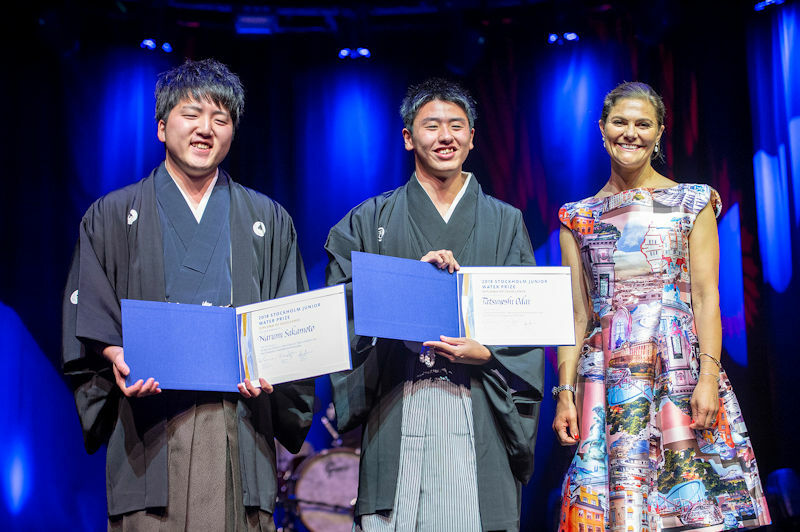 From left, the student team from Japan — Narumi Sakamoto and Tatsuyoshi Odai — receives the Diploma of Excellence from Princess Victoria during the SJWP awards ceremony. Photo courtesy of Jonas Borg, SIWI. A Diploma of Excellence also was awarded to students from Japan — Tatsuyoshi Odai and Narumi Sakamoto. For their project, “The New Green Revolution: Hybrid System of Phytoremediation and Food Production in Eutrophicated Ponds/Lakes,” they developed an integrated system that produces food while purifying eutrophicated ponds by combining plants, nitrifying bacteria, and mycorrhizal fungi, the news release says. Their prize included a $3000 award. 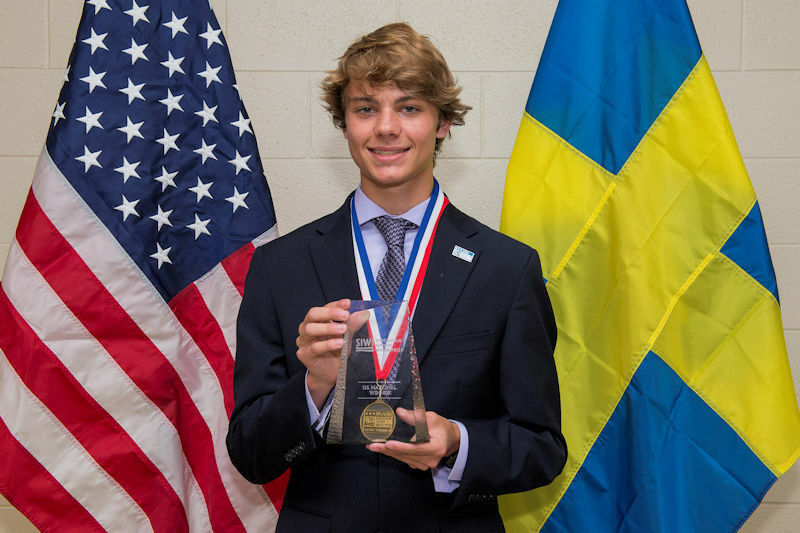 Braden Milford won the 2018 U.S. Stockholm Junior Water Prize (SJWP) competition for his research into using alginate beads to remove heavy metal contamination from water. Photo courtesy of AOB Photo. An international jury of water professionals and scientists selected the winners. The prize is administered by SIWI, sponsored by Xylem (Rye Brook, N.Y.) with assistance from The Raincoat Foundation (Stockholm). Finalists participating in the competition were invited to join WaterTank, a network of competition alumni. Through the network, these students can connect and collaborate with each other as well as mentors and advisors involved with the competition.